The region's popularity with tourists and second homeowners has come as a surprise to many as it's so far away from the coast. However, the deep forests and serene lakes are enough to lure anyone seeking a relaxing and picturesque place to stay. The climate can be pleasant throughout the year, though it is not as reliable as, for example, the south of France. The temperature here in the winter can drop to -10 degrees C, with snow and ice on the ground. The area is also prone to very heavy thunderstorms, especially in the summer, when temperatures can rise to 40 degrees C, though summer temperatures can also be similar to temperatures in the UK. The easiest route to the Limousin region from the UK is to fly into Limoges. Alternatively, the fast and efficient TGV train service will take you directly to the area from Paris. The other major attraction of Limousin are, of course, the extremely affordable house prices. The properties here are both diverse and full of character. You should have no problem finding properties with large gardens or areas of land. In the past, foreign buyers have not found the Limousin area particularly convenient. However, the decline in agriculture and the rise in budget airlines have contributed to its transformation into one of the most ideal places to buy in France. Recently, Channel Four's 'A place in the Sun' has named it the 5th best place to buy abroad due to its "beautiful scenery and quiet farming villages as yet relatively undiscovered". Prices are also very reasonable. Do you know Limousin better than we do? Do you have photos of Limousin? Due to increased transport links, the Corrèze has great investment potential. There are quite a few towns to choose from that are listed on the "Les Plus Beaux Villages du France" (the most beautiful villages in France). The Creuse is probably the most under-rated and unexplored department in France. However, you need a good pair of walking boots to explore the many wonderful sites found here. Ahun is a pretty market town in the Creuse department of central France, situated in an area known as the 'lake district of France', and which is every bit as delightful as the description suggests. The lovely riverside town of Aixe-sur-Vienne is found, as its name suggests, on the banks of the beautiful River Vienne, close to the city of Limoges. If you are seeking a part of France which is truly unspoiled by tourism or over development, then this could be the very place. The medieval market town of Ambazac is one of the many delights of the Limousin region of central France. Located just a few miles north of the regional capital Limoges, the town is visited by the Tour De France each year as well as playing host to many different sporting activities from golf to squash. Ambazac is also home to a glorious 12th-century church. The town of Argentat, which is located in the south of central France, is a friendly and vibrant little community lying in one of France's most unspoiled and little known rural areas. A typical market town, Argentat lies on both banks of the lovely River Dordogne, and its quayside restaurants are a delight for both visitors and residents. The town of Arnac Pompadour rests in the delightful surroundings of the utterly unspoiled Corrèze department in the Limousin region, the green lungs of France. The town is steeped in history and has a fascinating heritage, built, cultural and natural to discover, making it a fantastic place for a base in central France. All around the town are the typical landscapes of the Limousin, offering vast areas of woodland, lakes and rivers, filled with wildlife and opportunities for outdoor activities. Aubusson, in central France, is a town of architectural interest, with its turrets and carved doorways reflecting the past. While its name is synonymous with the finest carpets and tapestries, Aubusson is also a fascinating town offering a choice of property at reasonable prices. The tiny village of Aulon is found among the lakes, fields and woodlands of the beautiful Creuse department of the Limousin region of central France. Aulon is a peaceful escape from the modern world, yet is easy to reach from the UK and lies within just a few miles of bustling market towns with all amenities. The village of Azerables is found amid the lush countryside of the Creuse department in the Limousin region in central France. The village lies close to the well loved market town of La Souterraine, and is also close to the stunning lakes that characterise the Creuse and which offer great sports and leisure facilities. Beaulieu Sur Dordogne is an absolutely stunning town. It has been listed as one of the 'Plus Beaux Villages De France' (if you needed evidence). The town is also well known for its holy influence as pilgrims used tom pass through on way to Santiago de Compostela. The riverside town of Bellac, in the Limousin, is great for water-sports and other outdoor pursuits. Property in and around the town remains incredibly inexpensive. The pilgrim town of Bénévent L'Abbaye (so called as it is a traditional stopping point on the Way of St Jacques) lies in the heart of the Limousin region of south-west central France, in the pretty, green countryside of the Creuse department. With its Celtic Romanesque abbey dominating the town, Bénévent is picturesque, historic and ideally located for accessing many of the Limousin's finest attractions. The fresh green countryside of the Haute-Vienne department in the Limousin region of central France, is home to the very picturesque market village of Bersac sur Rivalier. The village, which has a vibrant community life and a lovely built and natural heritage to discover, is also easy to reach from the A20 auto route. The lovely village of Bessines sur Gartempe lies in the green countryside of the Haute-Vienne department of the Limousin region of south-west France. The village is of a good size and well equipped with amenities, close to superb leisure lakes and many historical points of interest. Bonnat is a charming market town which is found in the green folds of the Limousin countryside in central France. Among Bonnat's claims to fame are an old lavoir, a fortified church and a splendid chateau, which has its own motor racing circuit. Bourganeuf is a small town with an intriguing history. Situated in the Creuse department in the north-eastern corner of the green and lovely Limousin region of France, the town was once the headquarters of the Knights Templar organisation, a secret society with legendary links to both the Da Vinci code grail myths and the modern day Masons. The pace of life is considerably slower in the rural village of Boussac in the Limousin. It lies between contrasting landscapes and is perfect for those who enjoy the great outdoors. Property prices remain very low. Brive-La-Gaillarde is an ancient walled town in central France. It is famous for its highly successful rugby union team, and also for its book fair, which attracts visitors from far and wide. The country village of Bussière Galant lies in southern central France, in the region known as the Limousin. Often referred to as the green heart of France, Limousin is known for its agriculture and wide open spaces, and the town of Bussière Galant is typical of the region. Unspoiled, yet with good amenities and a lively and generous heart, Bussière Galant is quite lovely. Bussière Poitevine is a small market town which lies in the lovely rural surroundings of the Haute-Vienne department of the Limousin region in central France. The town sits along the edge of the Gartempe River, in a gentle and picturesque countryside of rolling hills, lush pastures, lakes and woodlands. The town of Châlus lies in the rural and beautiful Haute-Vienne department of the Limousin region in central France. The town has a ruined but famous chateau, where it is said the English king, Richard I was shot dead by a crossbow archer during a siege. The little village of Champagnac la Rivière, in the green heart of France, the Limousin, welcomes visitors warmly. With a population of fewer than 600 people, the village may not be the place for those who crave bright lights and a city that never sleeps. But for those others who love the peace of rural France, the generosity and warmth of its people and who dream of finding "La France Profonde", Champagnac la Rivière comes close to the ideal. The village of Champsac lies in rolling countryside in the lovely Limousin region of western France. Traditional and full of charm, Champsac offers good basic amenities and is close to many attractions as well as larger towns with excellent facilities for shopping, dining and leisure. Châteauponsac is lovely town, rich in history and character, that lies in the picturesque countryside of the Haute-Vienne department in the west of central France. There are many historic buildings and an acclaimed museum. Châteauponsac lies on the River Gartempe. The charming small village of Chénérailles is found in the heart of the green and beautiful Creuse department, in the Limousin region of France. Once a mediaeval walled city, Chénérailles has retained many signs of its illustrious history as an important crossroads town. Today, it offers good amenities and is perfectly located for further exploration of this lovely part of France. Deservedly listed as one of the most beautiful villages in France, Collonges la Rouge is an absolute must see. The village is built of a gloriously red-coloured sandstone, giving it its name, but it is more than just the colour that makes this village so spectacular. The traditional architecture, including fairytale towers, stunning facades and oodles of original features mark Collonges la Rouge out as truly magical, while the green surroundings of the Limousin countryside make a perfect backdrop. Compreignac is an authentic fortified town which lies amid the soft, green countryside of the Haute-Vienne department of the Limousin region, slightly to the west of central France. The town is small and tranquil in character, yet close to Limoges and many of the region's best attractions, guaranteeing plenty to do and see. Coussac Bonneval is a rural village found to the south-west of central France, in the green and pretty region of lakes and meadows known as the Limousin. With its beautiful castle and its delightful setting in the lush green fields of the Haute-Vienne, Coussac is a gem of a village, just waiting to be discovered. Crozant is a little village that lies in some stunning and unusual countryside, in the Creuse department of central France. Built on a prehistoric site, the village has been through many incarnations over the years, having been variously a feudal fortress, a Gallo Roman settlement, a victim of wars and an earthquake, and finally the peaceful and characterful village that it is today. Cussac is a small town in the Haute-Vienne department of the Limousin region in west central France. Traditional and picturesque, Cussac is set in lovely rolling countryside and is close to all the attractions of the region. The town is well equipped with shops and services to take care of everyday requirements. Darnac is a small village which is found in the tranquil, green countryside of the Haute-Vienne department of the Limousin region to the west of central France. The village is traditional and picturesque, and in a perfect location for accessing all the main attractions of this delightful area. The peaceful little village of Dompierre les Eglises is found in the Limousin region, slightly to the west of central France. Typical of the style of the Limousin, the village is historic and set in a very picturesque location on the River Brame. Nearby are all the features that make the Limousin such a well loved part of France: tranquil meadows, woodland, rolling countryside and wonderful lakes. Dournazac is an attractive small village that is situated in the lush green countryside of the Haute-Vienne department of the Limousin region of south-west France. The little village, famous for its wonderful Chestnut Fair held each October, is perfect for exploring not just the lakelands of the Limousin, but also the dramatic and beautiful landscapes of the Dordogne, just to the south. The little village of Droux is found nestling in the pretty rolling countryside of the Haute-Vienne department of the Limousin region in central France. Already discovered by British ex-pats who were attracted by the tranquillity and beauty of the area, Droux offers a life in a traditional village in the French countryside, yet with the added pleasure of having a British-run local bar/restaurant on the doorstep. Dun le Palestel is a town that lies in the rural Creuse department of the Limousin, in central France. It's a pretty town, with all amenities, and is situated in a great location for further exploration of this fascinating region. Evaux les Bains is a historic spa town that lies in the Creuse department of the Limousin region of western France. Able to trace its roots back to the Romans, Evaux les Bains has many sights of interest. It's also surrounded by a stunning countryside of lakes, rivers and woodland. Eymoutiers is a lively little town that is found in the south-west of central France, in the strongly agricultural Limousin region. With a population of 1,500, the town cannot be said to be large, but it has plenty of character and a real sense of community life. The pretty little village of Fromental is found amid the lush, green countryside of the Haute-Vienne department, in the Limousin region of south-west central France. There are various sights of interest around the village, including a 17th century chateau. The village is peaceful and rural, yet close to many of the Limousin's main attractions. The little village of Gorre lies peacefully in the green and pleasant land that is the Haute-Vienne department of the Limousin region of western France. Once derided as a poor relation to its more southerly sisters and to the sophisticated cities of the north, the Limousin is now one of France's biggest success stories, with ex-pats and holiday makers discovering the delights of the unspoilt countryside, historic towns and wonderful lifestyle that can be found here. Gouzon is a lovely little market town that's found in the green, rolling countryside of the Creuse department of the Limousin region of west France. With its rural setting, Gouzon revels in peace and serenity, but it's still close to many attractions. Gueret's great properties cater well for those who enjoy outdoor pursuits. The most popular are water sports, but those who like to enjoy the great outdoors while staying dry will be equally as pleased with what this town has to offer. Looking for a taste of rural France at great prices? La Souterraine is a pretty town in the North of the Limousin. It's a great place for those who enjoy a slower pace of life, rolling hills and plenty of outdoor activities to keep you busy. The very pretty village of Ladignac le Long nestles amid the green countryside and shimmering lakes of the Haute-Vienne department of the Limousin region in western-central France. The village is typical of its region, with stone cottages, steeply sloping Perigordian slate roofs and a charming rural ambience. Laurière is an attractive small market town that lies in the Haute-Vienne department of the Limousin, in central France. Within easy driving distance of the transport hub and cultural centre of the region's capital city, Limoges, Laurière is a good base for accessing all the best attractions of this lovely part of France. Le Dorat is a charming mediaeval town that is located in the green beauty of the Haute-Vienne department in south-west central France. Noted for its beautiful church, the Collégiale St Pierre, the little town has much more to recommend it to visitors, with delightful old streets and buildings and a fascinating history giving it a very special charm. This lively university town has a lot to offer the prospective buyer. Be careful not to overlook it, especially as it is situated in one of the cheapest area in France. In the green and rural Corrèze department of the Limousin region lies the historic village of Lubersac. This delightful village is equipped with excellent facilities and also offers plenty of opportunities for taking part in outdoor activities. Lubserac's heritage is rich and interesting, and the ambience is traditionally French and welcoming. The lovely village of Lussac les Eglises is found nestling in the green and pretty countryside of the Haute-Vienne department in the Limousin region of central France. With a population of only just over 500, it can't be said to be large, but the village is historic and interesting, and has its fair share of monuments and architecture to see. The village of Magnac Bourg is found in the centrally located region of the Limousin, in the department of the Haute-Vienne. It is essentially rural and agricultural, with green fields and apple orchards forming the dominant and beautiful backdrop. Magnac Laval is a charming old market town that is found among the green pasturelands and shimmering lakes of the Haute-Vienne department in rural central France. If "La France Profonde" is what you hope to find (that is an unspoiled, beautiful region with traditional villages and culture left intact), then Magnac Laval could just be your perfect destination. The pretty town of Marval lies in central France, in the south-west of the green and peaceful Limousin region. Every bit as "marvellous" as its name (at least, if you value tranquillity and charm over noise and hustle), this is a village which tends to capture the hearts of those who discover it. Benefiting from its position on the edges of the Dordogne and also the Charente, Marval makes a fantastic base for exploring this beautiful part of France. Mézières-sur-Issoire is a pretty little village which lies in the lush Limousin countryside. The village is a tranquil haven which has all amenities, and is ideally located for a rural retreat whilst still only 35 minutes drive from Limoges. Nantiat is a small but well equipped and lively town that is found in the Haute-Vienne department of the Limousin region, slightly to the west of central France. The town lies near to the principle city of Limoges, in a glorious countryside comprised of hills, pastures, woodlands and lakes. Objat is a rather elegant town which straddles the River Loire in the Corrèze department of the Limousin region. The town is noted for its excellent Sunday morning market, which attracts visitors from miles round. Objat has a wide range of shops and services, and is surrounded by picturesque countryside. The little village of Oradour Saint Genest is found nestling in the green and verdant landscapes of the Haute-Vienne department of the Limousin region. Oradour Saint Genest is an idyllic little bolthole for those wishing to experience the peace of rural France, yet remain close to all amenities provided by nearby larger villages and towns. Oradour sur Glane is found in the west of France, in the beautiful department of the Haute-Vienne in the Limousin. Known most of all for its tragic past, when it was the scene of terrible Nazi reprisals for an alleged involvement with the Resistance movement and the capture of a German officer, Oradour today is a town of two parts. There is the memorial village, which is the old town preserved exactly as it was that day in June 1944 when the Nazis came to take their devastating revenge, and the new town, which is an attractive and vibrant hub of modern life. The town of Oradour sur Vayres lies in the Haute-Vienne department of the Limousin region of south-west central France. Surrounded by the peaceful pastures and lovely lakes of the Limousin, Oradour sur Vayres is the perfect place to kick back, relax, and live the rural French dream. Pageas is a small village situated in the Haute-Vienne department of the Limousin region in central France. The village, which is surrounded by the typically green, rolling countryside for which the region is noted, is an ideal base from which to enjoy many outdoor activities or to explore the fascinating towns and sights of the Limousin and the neighbouring Dordogne. The attractive town of Pierre Buffière is located in south-west central France, in the green and pleasant land of the Limousin. The town is fresh and pretty, with white washed buildings and grey slate roofs, typical of the region. The tiny village of Rancon lies in the verdant countryside of the rural Haute-Vienne department of the Limousin, in west central France. The village's setting, on the River Gartempe, adds to its charms. It's a sleepy little place, steeped in history and seemingly undisturbed by modern life. Yet, it's close to many of the area's greatest attractions, and near to many character towns and larger villages for shopping and dining. The pretty village of Razès in the Limousin region in the heart of France, offers an opportunity for property seekers to find rural property at the sort of prices that seem to have gone out of fashion in most of France. Razès is a chocolate box pretty village in idyllic country surroundings. Rochechouart, in the green and fertile region of Limousin, is a picturesque little town. The narrow cobbled streets wend their way through the town towards the beautiful fairytale castle for which Rochechouart is famed. Saint Bonnet de Bellac is a charming village that lies in the Limousin region of France. Close to the mediaeval town of Bellac, it is surrounded by a typically Limousain countryside of rolling green fields, sparkling lakes and rivers and historic towns and monuments. The village of Saint Etienne de Fursac sleeps peacefully amid the green fields, golden sunflowers, beautiful lakes and deep forests of the northern Limousin, in the unspoiled department of the Creuse. If your idea of a dream home in France is to settle in a friendly village set in stunning scenery, then this could just be the place for you. St Junien is a town wrapped in a past of warfare and religion. Located in a lovely rural area, out-of-town tranquility can be easily found. Saint Laurent sur Gorre is a small market town which is found in the rolling green countryside of the Haute-Vienne department of the Limousin region of southern central France. The town has an important church, a mediaeval castle and wonderful botanical gardens, and all of this added to the glorious countryside and fascinating towns of the surrounding region should provide more than enough reasons to visit! Saint Léger Magnazeix is a pretty little village that is found in the beautiful, green countryside of the Limousin region to the west of central France. Saint Léonard de Noblat lies in the unspoiled region of the Limousin, in the green heart of France. This beautiful mediaeval town sits in a regal position on a hilltop, gazing down onto the waters of the River Vienne and the peaceful countryside of one of France's least populated regions. The town of Saint Mathieu lies in the Haute-Vienne department of the Limousin region of central France. An attractive old place with all amenities, Saint Mathieu has a beautiful leisure lake right on the edge of town, complete with a bar/restaurant. The surrounding, green and tranquil countryside of the Limousin makes Saint Mathieu a haven for nature lovers and fans of rural activities such as walking and fishing. Saint Pardoux is a small town set in beautiful and varied countryside. The landscape, with its picturesque villages, forests, rivers, lakes and undulating green fields where creamy coloured cattle lazily graze, is one of the most idyllic in France. The pretty little market town of Saint Sulpice Laurière is found nestled in the beautiful wooded countryside of the Haute-Vienne, in the Limousin region of central France. With its attractive old streets and houses, good amenities and superb fishing lake, the town is an excellent place to live or to spend enjoyable holidays in the peace and beauty of rural France. The bustling market town of Saint Sulpice les Feuilles lies in the green and pleasant countryside of the Haute-Vienne department in the Limousin region of central France. 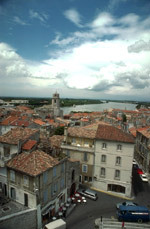 With an attractive setting on the River Benaize, the town combines a traditional atmosphere with good modern amenities. The market town of St-Yrieix-la-Perche lies in the Haute-Vienne department of Limousin, in the green heart of La France Profonde. The countryside here is the lushest and greenest in the country, thanks to the high rainfall and temperate climate. It is also some of the most peaceful and beautiful, and is a home for some of the prettiest little villages in France. Seilhac is a small town that is found in the green heart of France, in the unspoiled surroundings of the Corrèze, in southern Limousin. Popular with tourists, Seilhac has a superb lake for many different leisure activities, and is ideally situated for further exploration of this delightfully rural and largely undiscovered part of France. The village of Séreilhac is found in the green and pretty countryside of the Haute-Vienne department of the Limousin region, in the west of central France. The village is attractive and unspoilt, with a good range of shops and services and easy access to Limoges and the other major attractions of the region. The town of Treignac which is located in the south of central France, is a mediaeval market town that bears the distinction of being named one of France's most beautiful towns. Treignac lies on the River Vezere, and with its ancient winding streets and authentic mediaeval houses, it fully deserves its billing. It is definitely one to see. The very name of Tulle conjures up instant romantic images of beautiful silk lace bridal gowns. And the romantic imagery is not out of place in this lovely old French town which bears the same name. Tulle, once the producer of those fine fabrics, and capital city of the department of the Corrèze, lies in southern central France, in a region so unspoiled that it can truly be described as "La France Profond". Uzerche is a walled town that is located in the south-west of central France, in the Corrèze department of the agricultural Limousin region. Stunning in its situation, high up on a rocky hill above the rushing waters of the River Vezere, Uzerche does not disappoint at closer quarters either, as its beautiful and historic houses of local granite and winding old streets create an elegant and fascinating town. The little market town of Vayres is situated in the rural and picturesque Haute-Vienne department of the Limousin region of west France. It is often known as Vayres les Roses, thanks to the numerous roses that beautify the town from late spring 'til late summer. The town of Verneuil sur Vienne is located in the midst of the verdant and beautiful countryside of the Haute-Vienne department of the Limousin region, in southern-central France. Set against a backdrop of lakes and pastures, of woodlands and traditional farms and rural villages, Verneuil sur Vienne enjoys being surrounded by nature at its best, and offers an excellent quality of life for anyone wishing to set up home or to holiday in this unspoiled part of the country. In the heart of France - the distance from the sea is compensated for by the abundance of freshwater lakes commonly used for swimming. WHICH DEPARTMENTS ARE IN Limousin?